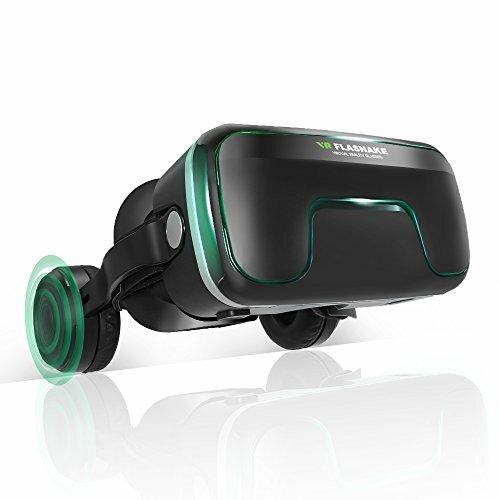 Why choose FLASNAKE Virtual Reality Headset? 1. Play a video, game or VR movie on your phone. 2. Put your phone in the front pocket and close tightly. 3. Adjust the headstrap for maximum comfort. 4. Adjust pupil & focal distance and headphone, then enjoy a panoramic theater experience. ▲This VR headset comes with a 3.5mm headphone jack. The iPhone X 8/8 plus 7/7 plus need a 3.5mm convert plug to connect to the headphone of the vr headset. ▲In order to experience high quality 3D feeling, you'd better use high resolution smartphones, support 720P, 1080P, 2K (Recommend). ▲Support myopia within 600 degrees without wearing glasses. ▶▶ADVANCED TECHNOLOGY - FLASNAKE 3D VR Headset are compatible with most IOS/Android smartphones with a screen size within 4.7- 6.0 inches (outer dimensions max 3.15″x6″). Such as iPhone X 8 7 plus, 6s/6/6 plus, Samsung Galaxy S5/S6/S6 edge/S7/S7 edge, Note 4/5/6/7, LG G3, G4, G5, G6, V10, V20, Huawei Mate 9 Pro, Nexus 5/6P, OnePlus 5, HTC U11 etc. The VR is a great and funny gift for your kids, family, friends at Halloween, Thanks Giving, Christmas, New Year's Day, birthday, party etc. If you have any questions about this product by FLASNAKE, contact us by completing and submitting the form below. If you are looking for a specif part number, please include it with your message.